Flood Bros Disposal presents The Skinny & Houli Show as we welcome back our old friend, and sponsor of the 4th Annual Irish American Movie Hooley, Eamonn Vaughan to the show. Once again Eamonn’s Irish pub, The Emerald Loop on Wabash, is sponsoring our 4th Annual Irish American Movie Hooley at the Siskel Film Center Sept, 28, 29, and 30th! 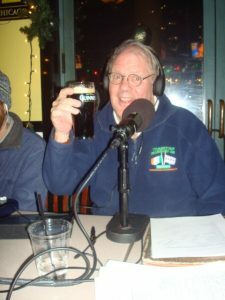 Eamonn has just opened his 7th pub up, this one on the Chicago River at Wacker and Wabash, The Chicago Brewhouse. It’s a welcome addition to the Chicago river walkway and Eamonn gives us the rundown on all the cool stuff in store for his customers. Then he takes us back in time to his parents coming over from Ireland when Eamonn was a teenager, and opening up their first tiny saloon, which has now blossomed to seven very upscale pubs under the banner of Vaughan Hospitality. It’s a great family business success story! Then we’re joined by Ed O’Brien and Donna O’Connor from the 50-ish Southside Reunion scheduled for this Thursday Sept. 20th at Bourbon Street, all are invited. Lots of laughs reliving some of our Southside stunts and everybody is looking forward to bumping into our old flames and pals next Thursday starting at 3PM until we all get too tired to stay up any longer! Great show, check it out!